U Juornu Avanti - "The Day Before"
Countless Americans owe the good fortune of their daily lives to a decision someone else made decades ago – but how many can even begin to understand the courage and the anguish involved in taking that step? Here is a short film that will make it all real for you. U Juornu Avanti (“The Day Before”) is a Sicilian language film with English subtitles which dramatizes a single day in the life of one man – the day before he leaves Sicily for America. With the promise of a better life ringing in his ears, Minicu makes tearful good-byes to his two brothers and his mother, who has sold her earrings to buy him clothes. He vows to send back enough dollars that she can buy as many new ones as she wishes. He says good-bye to his friends, asking them to watch over his family, and takes leave of his intended with the promise to return. He gets cautionary advice from those who have already crossed the ocean and from those who simply draw it from their hearts. Twin visual images – the beauty of the landscape where fog spills through the mountaintops like the rich, complicated, ancient history of Sicily itself and the striking expressions on the faces of its people deepen the experience for the viewer and make it more meaningful. If you are the son or daughter of immigrants from any part of the world, consider whether any decision of yours has had as much impact on your life as the one made on the day your ancestors stepped onto a boat bound for America. You owe it to them and yourself to understand as much as possible about their thinking and their emotions. 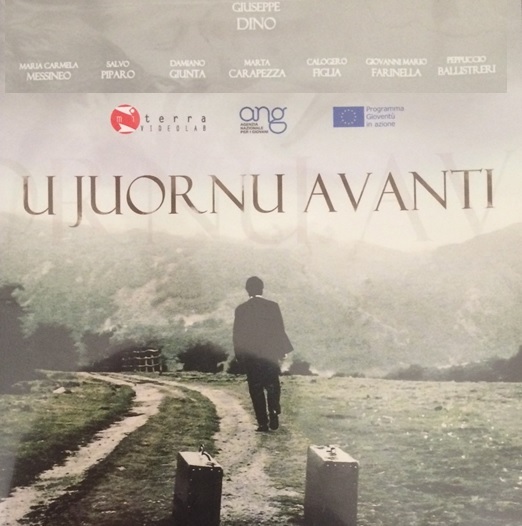 Un Juornu Avanti is a film that will get you there. The beauty of the young girl – her smile, the freckles beneath her eyes, her French accent. This is what stays with us. It’s always impossible to separate the appeal of beauty from its evanescence, but to have it torn away so abruptly, where is the lesson? Blues by the Beach is about the loss of innocence. If innocence is music and dancing and laughter then that is what countless patrons, an eclectic, global crowd, found in a Tel Aviv pub called Mike’s Place until the night was shattered by a terrorist bomb. 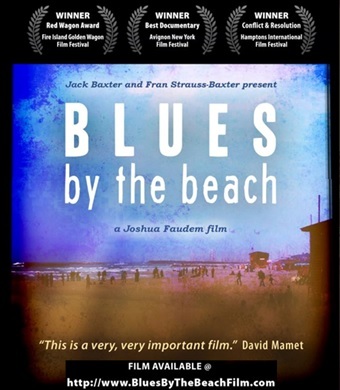 Blues by the Beach is an accidental documentary. Jack Baxter came to Israel from the Bronx intending to do one documentary, got sent in a second direction, and ended up with something completely unexpected and revealing. He stood before the audience and explained this, leaning on a cane, his constant companion since the blast injured 50 and killed three, including the French waitress with the smile. This screening was one of Cinemonde’s unique evening productions, #49 to be exact. It took place in the penthouse of the Roger Smith Hotel on Lexington Avenue. Glasses of wine and hors d’oeuvres shared by an enthusiastic group of select moviegoers led up to the viewing. Afterwards, the publisher and the artist of a graphic novel called Mike’s Place that re-tells the story in the movie answered questions for an audience that included the doctor whose quick work saved lives at the scene. The publisher told us that he had chosen the project because of the three love stories it tells. The artist told us something about his process that involved 1,000 drawings that took a year to complete and about what kinds of slight changes to a script the graphic novel format occasions. The owner of the bar towards the end of the film tells us how the bomb shattered more than physical things that could be repaired – that relationships ended. The publisher reminded us that one of those relationships was still intact, even stronger. Events have consequences; the filmmaker walks with a cane. Graham Greene comes to mind, superficially because “The Third Man” is the best example of a novel appearing after the movie. But more than that, Greene’s central characters always arrive in a foreign place and bear witness. Jack Baxter even sounds like a name out of a Graham Greene novel. For me, Blues on the Beach drives home more viscerally than any other film of its type the documentary camera as witness that turns all of us into witnesses. Cinemonde is the brainchild of Jerry Rudes, a consummate showman with something substantial to show. It calls itself “a smart, elegant private film series in New York City” to which, after one experience, I can attest. It is produced by Rudes' company, Mistral Artist Management, aptly named for the strong wind that blows across southern France with positive, lasting effects on the climate of the region. The next time a Cinemonde invitation pops into your email inbox, consider going. It’s well worth it. room in this ornate building was crying -- inconsolable sobbing. As I entered the room, one of the crying women looked into my eyes like the closest of friends, increasing my doubt. And then another pointed me to a row of chairs before a closed wooden coffin with a large cross on its cover. We soon learned that the acting had begun with the first tear. And that there were two audiences for those tears -- us and the invisible, now departed neighbors and relatives at this solemn wake whose parts we had just played without realizing it. And now, it was our turn to become invisible in this empty room where three sisters dressed in black sat on chairs facing the coffin. 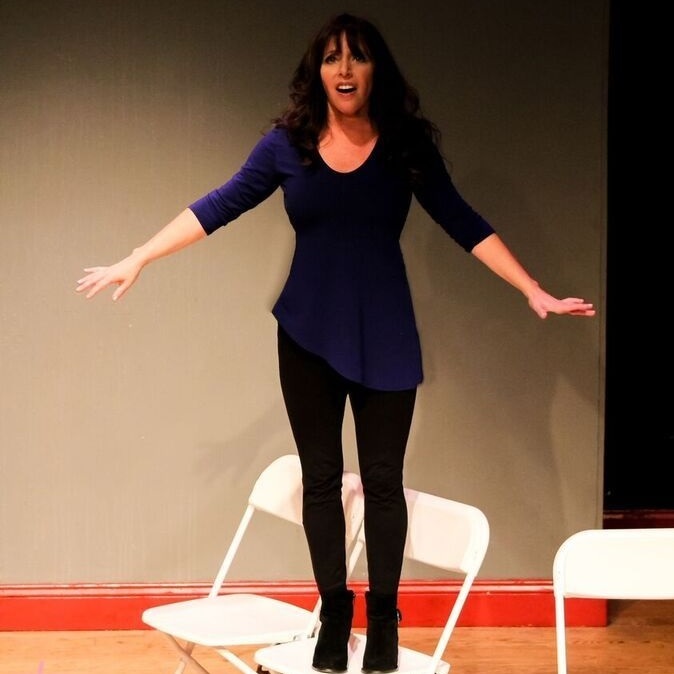 This staging is one more example of the inventiveness of InScena, the annual Italian Play Festival that takes place in the five boroughs of New York City, and of Laura Caparrotti, its founding artistic director. 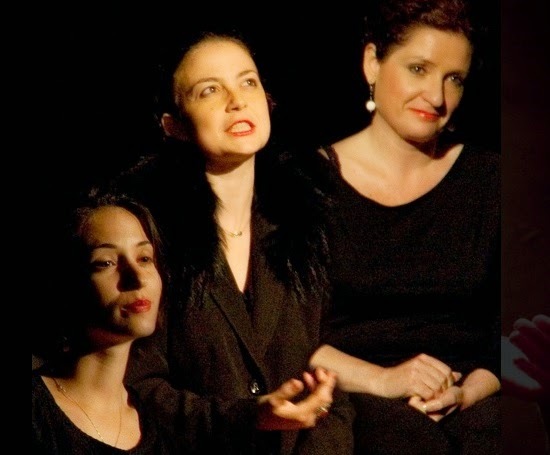 The play is Taddrarite ("Hidden Women" English title), winner of 2014 Rome Fringe Festival. InScena has finished its run for this year but will return in 2016. The tears in this play are real, but they are not for the dead man in the coffin. Rather, they are for the lives of the three sisters, who have suffered physical and emotional abuse at the hands of their husbands. For the men in their lives they have only sarcasm and scorn, delivered before us with humor and passion. Together, they pray "the false rosary" to our amusement but we get the serious message. It's not only that things like what they recount have happened to them, but how the shroud of silence, aided by the women themselves, has all but institution out of the behavior. But this is their breakout moment. As one of the sister confides: "Silence is the key that closes every door." But this play speaks loudly. What is a street in New York if not theater? And when you are on the way to a play named after a street that has earned a certain reputation the play begins before the play, surrounded as you are by characters playing themselves, high-heeled, rouged up, tattooed, the junky embracing the fire hydrant, the swank chick pushing the double stroller, the businessman with his briefcase, the man walking the dog, several men walking several dogs. Theater for the New City is just off St. Mark’s Place. Need I say more? It was the perfect setting for the final evening of In Scena! -- the two-week festival dedicated to bringing Italian theater to the streets of New York. When artistic director Laura Caparrotti, who had been enticing us throughout the festival with descriptions of things about to happen and things yet to come, turned up as the weary but lively former madam in the play, there was poetry in this. It did not take long to see why Carlotta Corradi’s play had won the festival’s first Mario Fratti Award for emerging Italian authors. In fact, I heard someone in the audience behind me say those exact words during the first exchange between the madam and Ira, the foreign girl who has answered the call for someone to clean up the house. Of course Ira has a past not unlike the madam’s; they are both finished with that life; but they are also entirely different personalities, evidenced by the fact that the older woman is now making her living by lending money at high interest and the young girl is looking for houses to clean. Everyone has a past. Through interludes, this play shows us the past and the present, and how the past meets the present. This is Europe post WWII. Everyone has suffered. The war’s biggest victim is innocence itself, yet innocence persists, even in the older madam, an atheist who constantly talks to God, a disappointing and disappointed mother who may just have found a true daughter not of her own blood who she christens with a simple white flower. On the streets of New York, we would call this tough love. Carlotta Corradi has found a real street in Rome with a real past and out of it she has created an imaginative, compelling conversation that you should hear. Laura Caparotti is Lina, the convincing older madam whose vulnerability, deeply buried, has been awakened by Giulia Bisinella as Ira, the embodiment of innocence itself. Ms. Bisinella’s portrayal of her character is so instinctual and thorough that it has a cleansing effect on the audience. The conversation between these two actresses is like a dance. Carlotta Brentan and Jojo Karlin, also characters with very different personalities, show us the past and then link to the present in a way that deepens the meaning of the play. Kudos to the versatile Ms. Brentan who in addition to acting and serving as executive producer of the festival, also translated Ms. Corradi’s script into English. Kairos Italy Theater, the preeminent Italian theater company in NYC, presented its second In Scena! Italian Theater Festival (www.inscenany.com <http://www.inscenany.com/>) in all five boroughs from June 9 to 24, 2014. The event featured six full productions and four readings. “Via dei Capocci” is winner of the first Mario Fratti Award for Emerging Italian Playwrights, an honor created and bestowed by the In Scena! Italian Theater Festival. I hesitate to call her a journalist because she so completely rejected that characterization. Hear that rejection in her own words convincingly delivered by actress Andrus Nichols whose portfolio of characters includes another strong woman – Bernard Shaw’s Saint Joan. Instead of journalist, the writer’s words in the mouth of the actress carefully explain that the moniker she prefers is historian in the moment. She imagines interviewing historical figures like Joan, Caesar, and Napoleon with the same intensity, challenge and distrust she applied to Henry Kissinger, Golda Meir, Willy Brandt, Nguyen Van Thieu, Ayotollah Khomeini and other elusive, prominent figures of her day. Imagination and poetry are at the heart of this production. 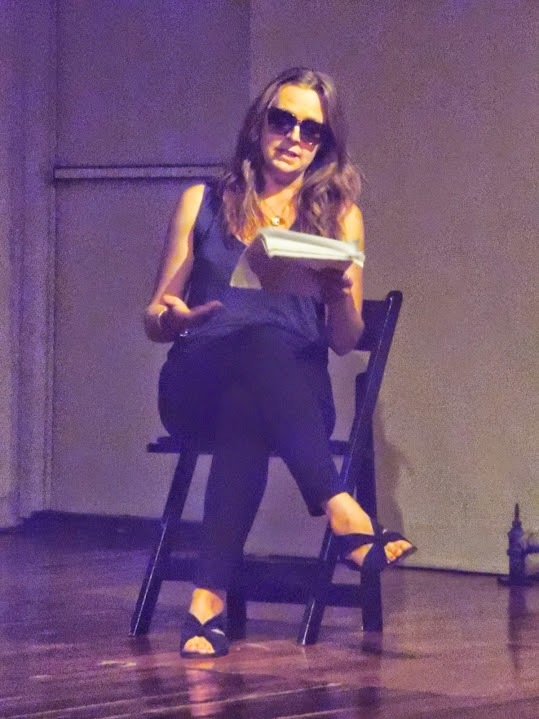 Playwright Emilia Costantini has weaved Fallaci’s own words together to create an interview that never took place. Two women sit on chairs facing each other, interviewer and interviewee, exactly the kind of free-ranging discussion of herself Fallaci never agreed to in life. The poetry is in the depth of the subject matter and artfulness of the words that make up Fallaci’s responses. She will tell us that writing is the most strenuous job in the world and that only written words have lasting value, that disobedience to the arrogant is mandatory – the only justification for the miracle of being born, if we do not protest injustice we are like leaves dragged in the wind, that war is the bane of human existence, that politics as a career is destructive to the world, that love is unknowable, that there is no reality like the death of a mother because it anticipates your own. She is a professed atheist, an eloquent spokesman for the soul, a woman at one with and against the history of her times. All of this comes through. This is a play based upon a novel written by an award-winning movie director, Paolo Sorrentino. The novel is nearly 400 pages long; the play is less than 5,000 words delivered by a woman playing a man, animating the dialogue impeccably with dance, gestures and song. Every spoken word is in Italian but that is absolutely no barrier for non-speakers thanks not only to the English super-titles that display above the action but also to the richness of the delivery. If anything, this play is a tutorial in how much more than words there is to a meaningful performance. Tony Pagoda, lounge singer, world-weary like all of Sorrentino’s characters, regardless of the medium, is about to experience what should be one of the highlights of his career – a performance at Radio City Music Hall where none other than Frank Sinatra will be staring back at him from the audience. Iaia Forte, the actress who played Trumeau in Sorrentino’s Oscar-winning “The Great Beauty” (La Grande Bellezza) rivets your attention as Tony. Only one other character intermittently appears on stage – a woman with whom Tony dances provocatively. Life is a song. Life is a dance. Tony may not be at the end – the music is still playing – but he’s definitely past the middle. He’s stuck in that moment that seems to fascinate Sorrentino – when his characters can no longer escape the conclusion that the promise of abundance has failed. Tony is disenchanted with the world, but he cannot claim innocence, none of us can. Tony Pagoda is past the point of fixing anything. He can only be eloquent about the place to which he has arrived. This eloquence Iaia Forte embodies for us. In the telling, she makes us forget that she is a woman playing a man, or that she is speaking a language that may not be our first. As Tony, she rails against all of those things that disgust him; Tony finally tells us he only likes “nuance.” Iaia Forte gives us nuance. I do see in all of Sorrentino’s work a flicker of hope – circumstances do not change, nothing develops except the possibility of understanding. For Tony what flickers is one word – a name with reverberations in the literature of his homeland – Beatrice. The In Scena Theater Festival is like an Italian feast made up of endless courses. That’s what I felt when Executive Producer Carlotta Brentan enthusiastically outlined for me the week’s lineup, like a master chef lavishly describing the specials on the menu. I have my eyes on three tempting dishes. Buon Appetito! Raphael Badagliacca has written two books: Father’s Day: Encounters with Everyday Life (www.fathersdaybook.com) and The Yogi Poems and Other Celebrations of Local Baseball (www.yogipoems.com). He appeared at the Soho Playhouse in a one-man show based on his first book. His second book inspired a workshop performance, “The Baseball Stories.” Readings of his stories have been heard on NPR. His very short play, “GPS” ran as part of Eclectic Shorts from March 23 – April 3, 2011 at Theater 54 in NYC. He is the president of SpaceMaster, Inc., an advertising sales software company with clients in the media industry.